Donald Judd was born on June 3, 1928 in Excelsior Springs, Missouri. He studied at the Art Students League, New York, 1948, and at the College of William and Mary, Williamsburg, 1948-9. He later took courses in philosophy, 1949-53, and then art history, 1957-62, at Columbia University. His first solo exhibition was at the Panoras Gallery in New York, 1957. Soon, he became a contributing editor for Art Magazine and then reviewer for Art News and Art International, 1959-65. Judd challenged conventions of originality by using industrial processes and materials and creating large, hollow Minimalist sculptures, which he arranged in simple, repetitive geometric forms. His held his second solo exhibition at the Green Gallery in New York, 1963, which established his reputation. In 1968, the Whitney Museum of American Art organized the first retrospective of Judd’s work. 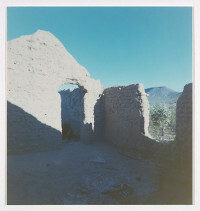 He moved to Marfa, Texas in 1972, where he would live and work until his death. In 1980, he participated in his first Venice Biennale; then in 1992, he was elected a member of the Royal Academy of Fine Arts in Stockholm. Throughout his lifetime, Judd published a large body of theoretical writings as well, in which he consistently promoted the Minimalist Art movement. Donald Judd died on February 12, 1994, in New York.